This Mori Lee wedding gown style 3058, is part of the Julietta Collection which is the designer's plus size wedding dress line. It is chiffon over satin fabric with alencon beaded lace in the bodice area. The angled delicate pleating in the chiffon through the midsection is figure flattering. It has a chapel length train. Great style for most figure types and any age bride! Guess what? It's for sale at an unbeatable price! This gown was brought by a bride who ended up with 2 of them and wants to sell one of them. "This mature bride had a hard time finding a wedding dress. She wanted something appropriate for a bride over 60. She first bought a gown from David's Bridal, that she later changed her mind about. So she decided to go shopping again. She hit the jackpot with this one! But she has to sell it. Why?" "Well she ordered this gown in a size 20 (bust 44-1/2, waist 36, hips 48) from a local bridal shop. When it came in it was one size too big. She felt that an 18 would fit her perfect and would reduce the alterations needed. So she decided to order the same style gown online in a size 18. which fit much better. Now she has to sell the size 20 gown. What does she want for it? Even though it is new and never been worn, she knows she can't get what she paid for it. 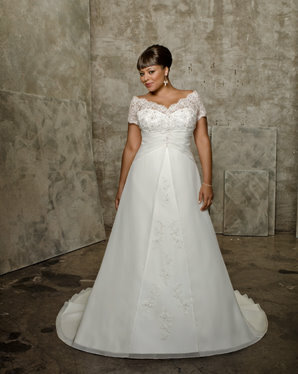 She paid $700 for it, and she only wants $450.00 plus shipping and handling, for this gown to sale it quickly. Again, It has not been worn or altered. And don't worry, it is an "authentic" designer Mori Lee wedding gown, not a replica copy from China. If you have seen Mori Lee wedding gowns, then you know they are well made. So if you think this Mori Lee preowned wedding dress might be your perfect wedding dress, contact me with any questions you might have or to get the sellers information! For more information about Mori Lee wedding dresses, check out this link.